Are you ready for some football?! DAY 7 is a touchdown on the countdown. It's a Sunday in December. That means football is in full effect. Kicking back, sipping beer, and scarfing down chow while watching a game is a staple of American culture. Whether your a fan of the sport or not, there is no avoiding the popularity. Its reach is so vast that not even the Turtles could avoid it. The green machines are football fans too. The football winter hat features TD Tossin' Leo in illustrated form. You might remember this lug as an action figure from the Sewer Sports line. The cap kept my childhood noggin warm throughout the winter months. I was no jock in those days and certainly not a big fan of the pigskin. 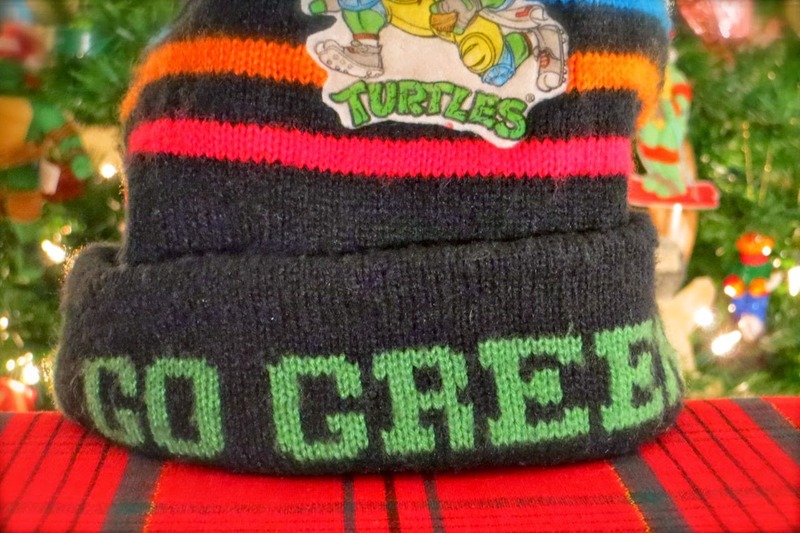 But, TMNT broke down the barrier, and I reveled in the mutant amusement of the football winter hat. If I had the talent to hurl a football deep into the end zone, I'd like to believe my fans would be bellowing chants of, "GO GREEN!" It has a radical ring to it, doesn't it? Today Santa has come to the sewers! Win this awesome prize package. The more places you post, the better your chances. The winner will be selected at random on Thursday, December 11th. The box of treasures will be shipped soon after. Good luck! Check back tomorrow for DAY 8 of 24 Days of Turtle for more festive fun, gracious gifts, and possible prizes! Until then, stay jolly, dudes & dudettes!